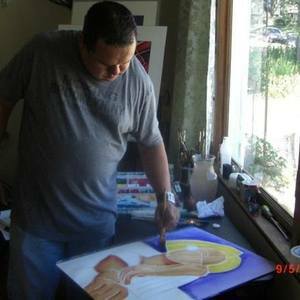 Although by trait he's been an art director & graphic designer, he never steered away from his first love of painting. Today his work is owned by a number of companies & private collectors throughout US. For the past several years Benjamin develop and evolved in his own style and technique. He's gone from super photorealism to cubism but it's mostly through the abstract expressionist movement that had the most profound effect on where his prolific work is today. His art minimize the amount of color predominating the variation of form making it largely confine to a periphery motif. While using mostly geometric shapes & gradients, the abstracts & many of his figures are executing in a loose brushstroke technique creating a form of expressionism in itself. Constantly utilizes & imparts tones with rich textures, he creates a intense definition. By doing so he improves & refines his minimalistic approach, executing with a meticulous eye, balancing a dramatic presence beyond it's initial appearance. This approach takes a amorphous shape that coalesce a portal that becomes a metaphor of his subconscious for love, passion & mystery.